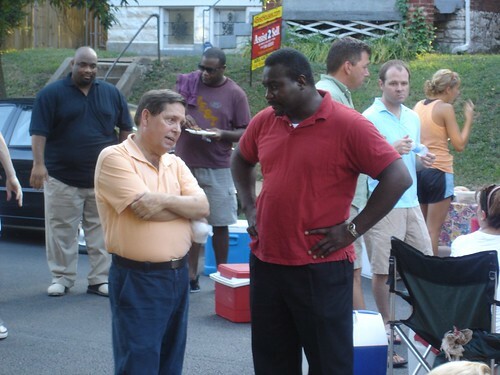 Mark & Lewis Reed, President of the Board of Aldermen, originally uploaded by chrisfreeland2002. We are gathered here today to celebrate the life of Mark Akers. My name is Chris Freeland, and I am a neighbor of Mark & Sharon’s. In his final weeks Mark asked that I officiate his service, and with the agreement of his family, I do so with honor. Mark Lyn Akers was born on March 29, 1954, in Belgrade and passed away Friday, January 20, 2012, at his home in St. Louis. Mark is survived by his wife Sharon, his father Lindell, his brother Kim and Kim’s wife Sandra, his son Sean and Sean’s wife Tara, and his grandchildren Aniya and Ezra, whom Mark liked to call EZ, and his beloved dogs Roxy and Murphy. The obituary that ran in the St. Louis Post-Dispatch described Mark as an “all-around great guy.” I think that’s fitting, and I think you’d be hard pressed to find anyone who disagreed that Mark was an all-around great guy. He had a strong moral compass. He knew what was right. That helped him in his job as a lawyer and a Prosecuting Attorney. Lawyers don’t always get a lot of respect, but Mark approached his job with a guiding sense of honor and integrity. For Mark being a lawyer wasn’t about ego or personal gain. He was driven by doing what was right for his clients, and helping people as best he could. But there was much more to Mark than just his job. Spend an afternoon around Mark and you quickly experienced his passion for sports. He loved to be outside, playing tennis or golf, just as much as he loved watching Mizzou football or the Cards win the World Series on his enormous TV. We liked to joke with Mark that his TV was bigger than he was. You knew that if his team was on, he could be reliably found basking in its soft glow. Mark was an especially enthusiastic viewer, providing more colorful commentary than the pros on TV, and he certainly knew more than the umpires and referees who could have benefitted from Mark’s counsel. And, if the dogs were hiding, you knew Mark was sharing his opinion, loudly, with the television. What you might not know about Mark was that he was a terrific dancer. He could really move. One of our favorite nights, one he mentioned often, was at a friend’s wedding. They had a great reception with a really good band, playing everything from Motown to disco to country. Mark and Sharon barely took a break from the dancefloor. We all had a wonderful time that night, and Mark said he danced so much his knees hurt for the next two days. Mark did okay because he had a large community of people behind him. His family and friends here and abroad, his neighbors in the city who all supported him. His son Sean and daughter-in-law Tara, and his friend Charlie Williams, a true “angel of mercy” who stayed with Mark during his last weeks. And of course, his wife, Sharon. In one of our last talks Mark described their relationship as “probably unusual-looking from the outside,” but it worked. Mark was loved, and he knew it. Mark was on heavy medication throughout his last day, Friday, but according to Sharon around 6pm he became alert and talkative. He said clearly, “I don’t know how to get there.” His brother Kim told him, “You get into your big Lincoln, turn on the heated seats, put on Martina McBride, and tool on down the highway.” And Mark said “Yes, that’s the way.” And that’s how he went, later that night. Mark passed the way he wanted: at home, peacefully, without pain, surrounded by his family, with his dogs at his side, in a house that he loved in an extended community that loved him. We should all be so lucky. And we were lucky, for knowing Mark. We are all the better for having had him in our lives. In his final weeks Mark and I talked about the readings he wanted presented at this service. We talked about traditional biblical passages, but none of those felt right to Mark. There was one poem he wanted read during the service here, as it was one of his personal favorites. It is Invictus, by William Ernest Henley. Let us pray. Heavenly Father, we’ve gathered together to celebrate Mark Akers and we now give him to your eternal keeping. Help his family find comfort in the days and weeks ahead. Let them know that Mark is at peace and has rejoined the family who went before him. Mark asked that I close here with the final passage from another of his favorite poems, Song of Myself, from Walt Whitman’s Leaves of Grass. It is non-traditional, like Mark, and perfectly fitting. Let’s bow our heads for a moment of personal prayer, and a reading of the passage Mark chose. What you have done for your neighbor, your friend Mark, is a great thing, Chris. This is not something anyone could have done, and I'm sure he knew that when choosing you to deliver this. Thanks, Phil. One of the harder things I've done in my life. NIce blog post about Memorable service. Also post this awesome post to all social networks and get awareness to all for your blog post.